Improved advanced composites manufacturing technologies developed by IACMI aid the integration of innovative practices and methods in manufacturing. Transitioning the United States into a clean energy economy will require the widespread adoption of transformative technologies that save energy and reduce emissions. Regulatory actions such as Corporate Average Fuel Economy (CAFE) aim to increase fuel economy standards for automobiles significantly by 2025. Fiber-reinforced polymer composites are a key enabler of energy efficiency gains and emissions reductions. High strength-to-weight ratios, exceptional durability and directional properties are some of the key benefits that make composite materials a valued choice for high-performance products across multiple markets and industries. The Institute for Advanced Composites Manufacturing Innovation (IACMI), Knoxville, Tenn., is accelerating the transition of advanced composites manufacturing technologies into the marketplace to facilitate the integration of innovative methodologies and practices across supply chains. The low-cost, energy-efficient production of advanced fiber-reinforced polymer composites in vehicles, wind turbines, and compressed gas storage applications is expected to revitalize U.S. manufacturing and innovation and yield substantial economic and environmental benefits. IACMI contributes to this vision through high-value research, development and demonstration programs that reduce technical risk for manufacturers while training the next-generation composites workforce. 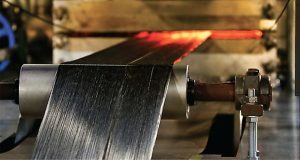 Composite Materials and Processes (M&P) technology focuses on material intermediates such as pellets, tapes, fabrics, low-cost carbon fibers (LCCF), recycling of carbon and glass fibers, nondestructive evaluation (NDE), materials characterization, novel manufacturing methods, and more efficient precursors and conversion processes. The M&P area is led out of Oak Ridge National Laboratory and the University of Tennessee, with partnerships from Vanderbilt University and University of Kentucky. Modeling and Simulation (M&S) technology enables digital product definition through the use of modeling and simulation tools as a foundational methodology for designing, manufacturing, and sustaining composite products; education and training of the next-generation workforce in design tools and methodologies; and exploring multi-physics phenomena for manufacturing polymer composite materials and structures into simulation tools. The M&S technology is led out of Purdue University, Indiana. Compressed Gas Storage (CGS) technology is advancing conformal tank designs, braided composite preform designs, and methods that enable reductions in safety factors to reduce the amount of carbon fiber required in tank designs. Composite materials help meet the growing demand for compressed natural gas (CNG) vessels and eventually hydrogen storage tanks — as a low-emissions alternative to gasoline and diesel. The CGS area is led out of University of Dayton Research Institute (UDRI), Ohio. Wind Turbine technology explores thermoplastic resins, segmented wind turbine designs, automation to reduce cost and labor content, and joinable pultruded wind turbine components. Today’s composite wind turbines-ordinarily made with thermosetting resins are time-consuming to produce, economically challenging to recycle, and increasingly difficult to transport as blade lengths grow in size to capture more energy. The wind technology is led out of National Renewable Energy Laboratory (NREL), Golden, Colo. Vehicle Technology seeks to reduce manufacturing costs and improve recyclability through innovative design concepts, low-cost tooling, robust modeling and simulation tools, effective joining technologies, and reliable defect detection methods. Rising fuel economy standards which aim to reduce emissions and improve energy security are compelling automakers to seek vehicle mass reduction opportunities through the integration of lightweight materials. The vehicles area is led out of the Corktown facility in Detroit and Michigan State University, East Lansing, Detroit. IACMI’s technical activities are organized by key subtopics that cut across the above five Technology Areas (See Figure 1). 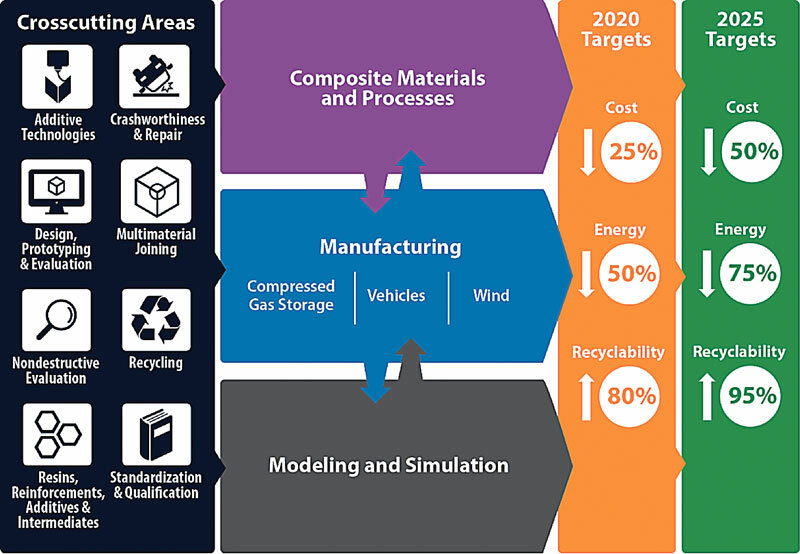 These subtopics capture the full range of enabling technologies needed to maximize progress against 5- and 10-year IACMI technical targets of cost, energy, and waste reduction for composites manufacturing technologies. Advances in carbon fiber technologies via alternative precursors, efficient processes, and interface engineering are critical to cost reduction at improved performance. Alternative precursors such as textile grade polyacrylonitrile (PAN) and processing approaches are being adopted to engineer carbon fiber materials that yield superior final part properties at reduced production energy levels. Recent advances at the Oak Ridge National Laboratory have enabled a low-cost carbon fiber (LCCF) at properties and cost metrics for automotive, wind and CGS (See Figure 2). Innovative reinforcements, resins, additives and intermediates are enabling fast cycle times, reduced scrap, integrated features and reduction of embodied energy. Integrated fabrics, braids, preforms and pre-pregs are used in rapid fabrication of door inner, floor, seat back rest, roof, trunk and under the hood auto components, wind turbine blades and composite tanks (See Figure 3). Advanced manufacturing techniques such as injection overmolding, stampable preforms, locally stitched preforms, high-pressure resin transfer molding are some examples that reduce composites manufacturing costs and energy consumption and improve component performance and recyclability. Figure 4 illustrates a locally reinforced preform to provide directional properties. IACMI has partnership with the Long Island, N.Y.-based Composites Prototyping Center (CPC), for prototyping and fabrication. Composite recycling is of growing interest to the composites community. 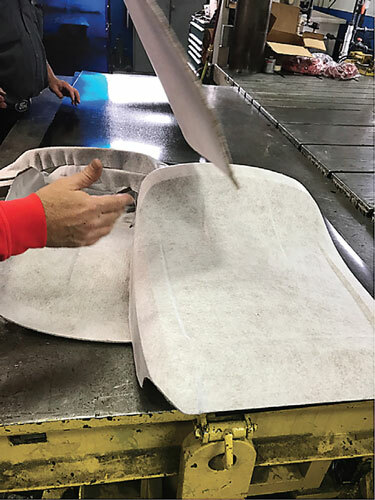 The next-generation technologies feature novel and increasingly complex combinations and formulations of fiber-reinforced composites, but these are difficult to recycle using current practices. Since recycled chopped carbon fiber costs 70-percent less to produce and uses up to 98-percent less energy to manufacture compared to virgin carbon fiber, recycling technologies are creating new markets from the estimated 29 million pounds of composite scrap sent to landfills annually. Advances in recycling technologies including pyrolysis, solvolysis, mechanical shredding and cement kiln incineration are enabling recycle, reuse, and remanufacture of products. IACMI has strategic partnerships in the recycling technologies with the American Composites Manufacturer’s Association (ACMA) and Composites Recycling Technology Center (CRTC), Port Angeles, Washington. 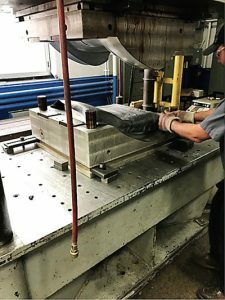 Additive technologies in composites manufacturing offer a high-rate, low-cost alternative to traditional tool-making approaches, and shows promise as an effective processing method for printing composite structures from reclaimed structural fibers. Additive approaches have the potential to significantly reduce composite tool-making lead times and increase the recovery and reuse of structural carbon fibers. Advanced thermoplastic resins into current production processes: Thermoplastics have shorter cycle times and are more suitable for recycling. Increasing the use of thermoplastics for requires a variety of activities, including developing of novel in situ polymerization methods to improve thermoplastic fatigue performance, and establishing design-for-recyclability methods. Design, Prototyping, and Validation (DPV) are integral steps to turning conceptual designs into high-performance components and verifying that these components meet their intended product requirements. These product development steps rely on a robust understanding of material limits, processing capabilities, principles of mechanical design, and best manufacturing practices to optimize the safety, reliability, and performance of a system. IACMI is advancing innovative vehicle design concepts by addressing activities such as facilitating round-robin studies that compare composites joint and interface designs for various assembly methods, establishing design optimization approaches for manufacturability and recyclability, validating composite crash simulation models, and creating techno-economic analyses of automotive composite parts to provide manufacturers with design, prototyping, and validation examples. Modeling and simulation tools for automotive applications require a range of activities including assessing variability in end-to-end simulated manufacturing processes, conducting accelerated tests and validating models with experimental data, incorporating composite joint designs in crashworthiness models, and sharing key materials properties to inform simulation efforts. The integration of these efforts in IACMI is enabling to reduce product development time. environmental benefits and help to revitalize U.S. manufacturing and innovation. 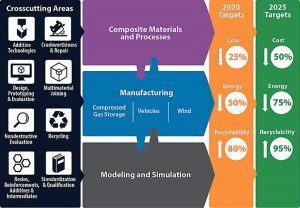 IACMI-The Composites Institute is playing a pivotal role in shaping future competitiveness and job growth in the United States, and the technical activities needed to accelerate progress toward this vision. Editor’s Note: Dr. Uday Vaidya is the UT/ORNL governor’s chair in Advanced Composites Manufacturing, University of Tennessee, Knoxville, and chief technology officer at the Institute for Advanced Composites Manufacturing Innovation (IACMI), Knoxville.